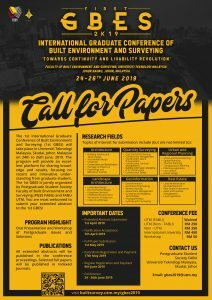 Faculty of Built Environment and Surveying, Universiti Teknologi Malaysia (FABU UTM) in collaboration with UTM Postgraduate Student Society (PGSS) FABU would like to invite Universitas Indonesia Postgraduate Students to our 1st International Graduate Conference of Built Environment and Surveying 2019 (GBES 2019). Prospective authors are invited to submit a manuscript in English. All papers will be published in the conference proceedings. Selected papers will be published in selected journals. Please mark this event on your calendar and get ready to share your research! Award will be given to the best presenter for each parallel sessions and best of the best for each track. For further information, kindly visit our website at http://builtsurvey.utm.my/gbes2019/ or you can contact us via email at gbes2019@utm.my. SUBMISSION DEADLINE FOR EXTENDED ABSTRACT IS ON 1 APRIL 2019.